Its 3pm on January 2nd and I’m 20 mins into my first ever FTP test on the turbo. Thierry from Jura sports, my newly appointed coach, is next to me and also doing an FTP test, “to keep you company” he says. He looks strong despite ligament surgery 6 weeks before. Conversely I look like crap and feel worse. Still suffering from my New Year’s eve excesses and a lack of riding in the last 6 months. In part due to the winter weather and the arrival of our second child (who by that point is still keeping us up half the night), the culminated effect is evident on the meagre power I am able to maintain. Every 5 mins I find I have to lower my target power to stand a chance to maintain it for the rest of the 30 mins sweat fest. I finish and the results are worse than I feared and Thierry if he is honest would agree. 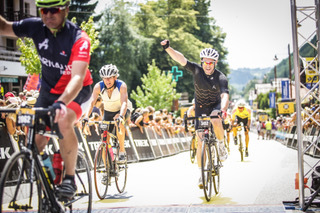 Before going to the FTP test my goal was to finish the 2018 Etape du Tour (169kms and 4,000 m elevation) in under 8:30hrs and make the top third of starters. Now my goal is to finish it. Thierry provided me with a personal training plan based off the FTP result and a series of other tests. The plan required two gym sessions and two turbo sessions a week. Importantly I felt I could manage that with the other usual life commitments of work, family etc. Thierry updated the plan monthly based off my feedback and the data from Garmin Connect. We also spoke regularly about how I was doing, what was working and what was not. Fast forward 7 months. I finished the race and managed to meet my other goals too. Here are my lessons learnt which I hope you can benefit from. 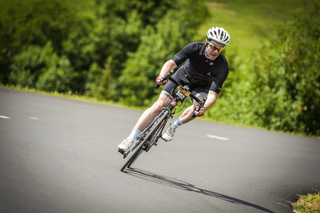 For perspective: I’m 42, was 75kgs in January and this is my 4th Etape race in 8 years. 1. Do the race with a friend. You compare training progress, it keeps you motivated, you see curtesy of Strava if he / she has gone for a ride when it’s raining and so you go too. 2. Get a Coach, it works. It’s not essential but I doubt I would have been as dedicated to my training, efficient with my time or progressed as quickly without Jura Sports. 3. The Gym and especially core work program delivered much faster results than I ever expected. I did not get injured and I was much more flexible in my body as a whole. 4. Shorter term goals keep you engaged. The tests Thierry asked me to do showed I was making progress and quickly. This kept me motivated. 5. Everyone says it: train early in the morning to get it done. It also has a smaller impact on family life. There are other benefits too. You tend not to drink the night before knowing you will be up early and it energises you for the day. 6. Stop drinking alcohol to loose weight. I wanted to be 70kgs for the race, I got to 71.5 in the end and this was mainly through not drinking for 8 weeks paired with longer rides. I found I needed less sleep and the quality of my sleep was better. 7. Ensure your partner supports your goal and the level of training required. An Haute Route challenge is going to require a boat load more training than a one day race. 8. Maintain an Off season base. My friend (who I was doing the race with) cycles to and from work. This alone meant he started with a base fitness that took me at least 8 weeks make up. 9. Recce the course if you can. This certainly gives you confidence going into the race. Perhaps too much in my case. When I did it the temperature was 10 degrees less than on race day when the heat caught up with me. 10. Enjoy it – it’s another cliche and one I struggle to adhere to, as I tend to focus on meeting my goals. The progress I made in training with Jura Sports was significant and I met all my goals. While I managed only about two thirds of Jura Sports’ nutritional guidance in the build up to the race I was 100% on my hydration, a bidon within arms reach all day. Essential, given the forecast for the race was getting warmer by the minute. With the bikes loaded and pre race checks completed, we tucked into Spaghetti Bolognese for dinner at 6pm, washed down with the usual pre race banter. This is where I believe it started to go wrong for me, more on that later. Concerned about being ‘under fueled’ I ate even more than I normally do (specifically more sauce which takes longer to digest). We woke at 3:30 am. On a whim I decided to eat an omelette with cheese and ham, because ‘that is what the pros do’. Then I ate my usual granola, yoghurt and fruit. Drank more water. At the start line, just 3 hours later I ate a large homemade cereal bar. The atmosphere was excellent with riders from all over the world. Some clearly well prepared and others in trainers and a backpack in for a long day. Soon I was rolling over the start line feeling a little like the Michelin man. The first 45 mins I kept the HR lowish in Z1/Z2 trying not to do too much work in the pelleton. I had recce’d the course 4 weeks prior except these first 40 kms which did not look like much on Strava. As a result I was feeling confident about the race and I hit the first brief climb out of Talloires strong ie at my ftp, but kept my HR in check. Same story for Col de Bluffy. In hindsight, while both climbs were small I think this was my second small mistake. I had started in pen 3,000’s and I got carried away with the excitement and tried to keep up with the group vs ride my own race up these two climbs. We rode pretty hard and fast to Thones, the base of Col de Croix de Fry. I had been bursting for a pee since the start of Col de Bluffy and I was not going to climb with a full bladder again. A lone bush provided a very public opportunity to relieve myself, but I did not care, time mattered. I really like the Col de Croix de Fry climb. It is classic alpine scenery, the front half is not too steep and I kept a good cadence and rode a PB. Despite this strong start I did not feel good in my stomach. The heat was only starting to build and I had drunk relatively little of my bottle and unconsciously I had eaten nothing by the time I hit the climb up to Plateau de Glieres. Though steep, it’s a climb I had masochistically enjoyed on the recce. But not today. It was so much hotter. My stomach was now cramping and the power was not there. My mind started to wander, why was I not as strong as before? At the water refill stop on the plateau I realised I’d only drunk one large bottle after 2.5hrs of riding. Clearly not enough. I had also not eaten much, maybe one gel. I was starting to question last night’s spag bol. Was that the cause of my discomfort? The repaved road off the plateau took my mind off it. It was so smooth and fast, everyone was flying. It was at the Col des Fleuries that I knew I had got my nutrition wrong or the heat was taking a lot bigger toll than I expected. I crawled up it, but I pushed on. Experience reminded me not to go too hard and solo on the flat trying to reach the group in front. A big group will soon race by and pick you up. Sure enough it did and we sailed to the base of Col de Romme. After a refill and a chat to my friend (he too was questioning the spag bol) we took on the climb. Many people don’t mind this climb. I loath it. Perhaps it’s because it comes at the end of the races I’ve done on it and you know there is the Col de la Colombiere to follow. Or because it’s really steep in sections and has exposure to the sun. For the first time since I’ve been riding, I had to stop, pull over and tried to be sick. Disappointingly unproductive, I rode on or rather crawled up to the summit. After a brief stop and a can of coke I set off up Col de la Colombiere. Maybe the coke worked as it was much more enjoyable and I managed to keep both the stomach and leg cramps at bay. Others on the side of the road faired a lot worse with leg cramps. The midday sun had taken its toll. I love the descent off the top of the Col de la Colombiere. It’s fast, wide with good visibility, my stomach was feeling better and I gave it my all to try to limit the loss on the climb. Never really going to happen, but I tried. I crossed the finish line at 8:14 and just made the first third of starters. I had met my goal; but given how I felt throughout I can’t help but thinking: could I have been a bit faster? It’s been three weeks since the race and I’ve had a chance to reflect and noted the lessons learnt. Don’t change your pre race nutrition routine on race day. I had done so many training rides with the same breakfast. Yet on the day I chose to do something different. I also believe I ate too much spag bol the night before, especially the meat sauce which was too heavy and hard to digest. I was not hungry for breakfast. I trained mostly in the early morning when it was cool. I suffered a lot more than expected in the sun. So did many others, but a race or two in the midday sun would have helped me prepare more. Finally, nutrition aside, I recognise I had a finite amount of time to train and started from a very low base. Thierry from Jura Sports gave me a comprehensive program and I saw myself progress every couple of weeks. This has given me as much satisfaction as the race itself. I realise I can improve quickly which leaves the question: what’s next? All I know is I won’t be eating spag bol the night before! 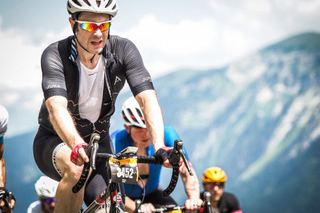 If like Julian you want to prepare your next challenge such as the Etape du Tour, contact me at thierry@jurasports.com and find out more about our cycling training camps and coaching programs.